Here are the Top 10 Spring Cleaning Tips to organize and beautify your living space. 1. MAKE A LIST: List all parts of the home in need of organization - closets, drawers, cabinets, attic, garage - whatever needs cleaning out. Then select ONE item from the list and IGNORE the rest of the list for the moment. 2. GROUPING: Once you've chosen a space to clean out, simply separate the items into two groups - "garbage" and "not garbage." Have a garbage bag ready. When you complete this step, half the work is done. Next, group the remaining items into whatever groups apply to your living situation. For instance, "books" and "not books," then replace the books onto the bookshelf. Continue this grouping technique until done. 3. TAKE YOUR TIME: Spend twenty minutes per day for spring cleaning. It will feel like you’re working at all, but after a while your home will be well organized all the time. 4. BEGUN IS HALF DONE. In other words, getting started is literally half the battle. No need to plan the process. Just open that closet or drawer or garage and begin. 5. CLEAR AS YOU GO. Whenever you're about to leave a room, look around for things nearby that belong in the rooms you'll be passing. Take them with you and drop them off where they belong. This doesn't feel like work if you were going there anyway. The trick is remembering to do it. 6. DO FLOORS AND WALLS: Keep wood floors clean. Freshly cleaned wood floors give the home an "expensive" appearance. Hire a steam cleaning company for carpets if you can. If not, it's well worth doing yourself. The look of walls and floors make a tremendous difference to the ambiance your home. 7. 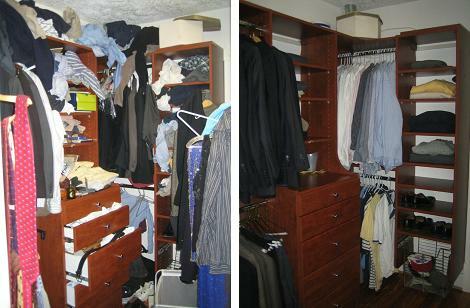 GET THE RIGHT SUPPLIES: Invest in closet organizers, document file systems, and adequate shelving. These can be found at almost any large discount store. 8. MAKE THE BED. This one is probably the easiest of all spring cleaning tips. In terms of sheer labor, making a bed is the most cost-effective thing you can do for your home. This simple three-minute task works cosmetic wonders. A well-made bed alone can make a messy room look 80% neater. 9. USE LABELS. Put sticker labels on drawers, compartments or any sectional organizing systems in your home. 10. YARD SALE! Don't be too emotionally attached to your stuff. Put an ad on craigslist and sell everything you don't truly love or need. Price your items real low. You'll not only end up with a cleaner home, but some extra cash as well. See the Main Lists Page.